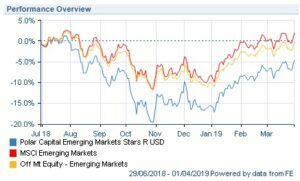 When Jorry Nøddekær joined Polar Capital back in June 2018, he may not have anticipated the pounding that his newly launched Emerging Markets Stars Fund would take in the months that followed. For every £1,000 invested in the fund at its inception on 29 June 2018, investors would have lost £43 by 1 April 2019, according to data from FE Trustnet. That figure excludes fees. This performance measure, of course, is unkind. The fund’s objective states that the strategy is focussed on long-term capital growth. Nøddekær’s career record shows he is more than capable of delivering just that. The once AAA-rated fund manager left his position as head of emerging market equities at Nordea Investment Management, to join Polar in 2018. He spent seven years working for a fund group that is universally lauded for its appreciation of sustainability metrics. It’s fair to say that this experience has influenced his thinking today. Nøddekær believes that his sustainability grounding at Nordea, and his roles prior to that, will eventually vindicate the ESG-linked investment decisions he is now taking in his new fund, despite a fantastically underwhelming start which has left him lagging the MSCI Emerging Markets benchmark by more than 5%. “I have been working with emerging markets, SRI and sustainability issues for quite a number of years,” he told ESG Clarity in an interview. Nøddekær explains that one of the “big attractions” of Polar Capital was that the management team offered the opportunity for him to build a new valuation framework within which to analyse emerging markets. It considers environmental, social and governance-based metrics and Polar bills this fund as a “sustainable emerging markets fund” – quite the marketing promise. This new approach includes an extended SWOT-analysis of companies, which blends traditional analysis areas like market dominance, capital efficiency and balance sheet risk with sustainability factors such as business ethics, industry risk and ESG headwinds. These analysis points are then broken down still further and individual ESG issues (such as corruption, health and safety, energy efficiency, etc.) are isolated into sub-categories of ‘E’, ‘S’ and ‘G’. Each holding will then be allocated dozens of scores for individual sub-metrics. The impact of these sub-metrics on the likely investment performance of a stock is then calculated in a forecast, as part of this proprietary process. This detailed and incredibly complicated approach Nøddekær describes as “third generation”. He says fund firms employing only negative screening are using a “first generation” approach while those with only an appreciation of variables are “second generation”. This desire is certainly ambitious. And, as the figures show, has so far not resulted in outperformance over the short-term. But Nøddekær knows that the his enormously intricate method of analysis is on the right side of change. Historically, emerging market companies have produced little or no information on sustainability, but reporting is improving, albeit slowly, and third party data providers are beginning to conduct their own analysis of corporate ESG behaviours. This is ground-breaking, according to Polar’s new recruit. Nøddekær will also use his data analysis techniques to flag areas where engagement may be needed with investee companies. While he appreciates that he is currently a minnow, compared to some investing in the region, he believes that engagement and stewardship can yield positive results for investors nonetheless. “We are not an Elliott of a big, aggressive hedge fund,” he says. “We do not have the size to command that. Besides, that isn’t our style. But sometimes, there are core issues that need to be addressed, and we will try to address it with them. Consider it like advice. Despite the shaky start, fund selectors will certainly be watching the progress of this new approach and to see whether Nordea’s former star can rise again.